On October 15th, 2012, Fela would have been 74 years old. My little sister, in her mid-teens, is clueless about this legend that died at the climax of Military Rule in Nigeria. Worse still, she is an undergraduate and together with her fellow freshmen, the likelihood of drawing blanks at the mention of Abami Eda is a definite absolute. And even if they are knowledgeable, the myth would resonate ahead of the man. A famous musician who lived on Gbemisola Street, Ikeja with his harem of wives. A weirdo who smoked a lot of Marijuana and was always in trouble with the Nigerian Government. This perhaps will have been the myth handed down to the younger ones as Fela’s legacy, if not for timely interventions like the Kalakuta Museum. Nigeria’s major export of late, save crude oil, is her contemporary music. The prolificacy of locally-produced music is incredible; there must be an appropriate demand to incur such an overwhelming supply. While the anti-intellectual content of most of these songs is another kettle of fish, I have tried to understand the philosophy of Nigerian Hip-pop. It often eludes me. Highlife music, for instance, can be described as West African Independence sound as well as a Neo-colonialism totem; it was essentially dance-room orchestra bands that had played for the colonialists now playing indigenous tunes with the same ensemble, a sort of syncretism between the Western culture and ours, a blend, an amalgam if you wish. Juju music, arguably a variant of Highlife, is no different, but please what is Nigerian Hip-Pop music? A syncretic imitation of American popular sound and the Nigerian bourgeoisie dream? Music, as an article of culture, should be a continuum: the tradition of forebears should resonate and reflect in their progenies. Again, this is another kettle of fish. Fela’s LP records are journeys, often torturous and consequently abandoned by the impatient, the uninitiated. Look and Laugh, a mellow reflection critical of Nigeria’s 2ndRepublic lasts for a whooping 30 minutes; Fela’s chant does not waltz in until about thirteen minutes after the opening tunes. The fashion of Afrobeat is a lot different from Highlife: it is intellectual languor to appropriate both genres. The difference between both genres is a doctoral thesis by itself. Fela began his musical journey as a Jazz musician playing Highlife. The music was so called Highlife Jazz and it was different from the Highlife of his contemporaries—Roy Chicago,Orlando Julius and Rex Lawson—and his forebears, Victor Olaiya and Bobby Benson. His music was deviant and richly influenced by American Jazz, even though his vocals were clearly Yoruba and his themes ranged from folklore to love songs to quotidian issues. The ripe riffs of his trumpet solos were delightful; it was jaunty music with a tinge of genius and a promise of greater things. His songs were rife with foreign influences that perhaps were not popular with his fans. The typical Fela session in the early Sixties was not known to drag a lot of ladies to the dance floor, but his charisma was known to lure women to him after his shows. It would take a trip to America, from which he returned impoverished but where he met the Black American lady, Sandra, to be set on the path of invention. It irks me sometimes when studio acts like D’Banj are referred to as Afrobeat musicians by Europeans. 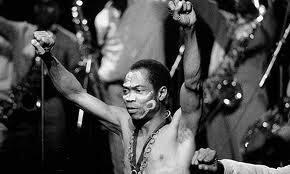 Fela was also irked by the European coinage of Afro-Rock to describe his music. To say this is to undermine what Afrobeat really is. D’banj shares some similarities to Fela alright. The lean body frame and light complexion, the formidable stage presence. The similarities stop there. Any Afrobeat musician worth his ilk plays proper wind instruments; Still, any Afrobeat musician should perform live music with a band—there is no place for lip-synching over a recorded song, or worse, an instruction to a Disc Jockey to blare tracks from a Compact Disc. Army Arrangement, mastered while Fela was in Police custody, was done with studio synthesized string intros. This incurred his wrath and necessitated another version. Fela decline’s, if there is anything such called, most critics believe began in the Eighties when he became critical of the Nigerian Government and his politics resonated the most in his tunes. It was indeed a torturous journey from where Fela began. He had returned from Britain to play stylised Highlife, returned from America with a fistful of Black identity, and set himself in the path of a musical odyssey. In the Sixties, Fela played his Highlife Jazz songs about soup and witchcraft to empty dance halls. His activist mother told him that there was no way anybody would listen to him if his band was called Koola Lobitos. His American girlfriend told him that he needed to pursue more ambitious subjects beyond soup and food. Then he discovered the miracle of chanting: his dance floor flourished. In the light of the Oil Boom of the Seventies, there was attendant corruption and the masses needed to raise a voice: Fela raised his. For this, he was often censored and punished. His house was razed down twice by havoc wrecking soldiers; his mother was thrown down and injured; Fela’s bones were broken. These events were catalogued on several of his songs:Kalakuta Show, Pansa Pansa, Sorrow Tears and Blood, Coffin for Head of State, Unknown Soldier, and Overtake Don Overtake Overtake. How does one now begin to criticise Fela’s plough into the deep reaches of Nigerian politics after all these unfortunate events? Fela’s Afrobeat was a fraternal twin of circumstance. Music had to become a weapon, albeit that of self-defense and also a vessel for societal criticism. Afrobeat, an abstract odyssey from Highlife, carried a Mission Statement from the outset.Don’t Gag Me was one of the early tracks on that road to greatness that carried a manifesto that would define the maestro’s career: a vehement struggle against censorship at the cost of both physical and character injury. Fela has been dead for seventeen years. Afrobeat is not dead. It lives on in the horn of his sons, both consanguineous and by ideological proxy. There is no doubt that Afrobeat has evolved since Fela waxed his tribute to Thomas Sankara in the early Nineties, his last record. Afrobeat has risen from its country of origin to become an international concern. Every practitioner has imbued the sound with their various input and idiosyncrasy. There has been robust dialogue and criticism within the music itself, those that bother on technique and style. I remember vividly the ascent of the sandals-wearing Masked One in the mid-90s into the Afrobeat scene. How he deployed the talking drum—an article of Juju music and South-Western Highlife—in his music. How he invigorated the dance-floor with his Bata dance. Femi Kuti has refused to remain in his father’s shadow; rather he does his own style of Afrobeat, a fine version in its own right. His music is less brash; he has equipped the complex amalgam of Afrobeat with a recipe that make the sounds better cohere. The benefit of this is an international attraction which one cannot also be divorced of Fela’s indirect refusal at international acclaim. Seun Kuti leads the Egypt 80 band and has been recording his tunes which are often full of nostalgia; his subtleties are his but his entire build is reminiscent of his father. Funso Ogundipe also brings a refreshing outlook with his laid-back Afrobeat which appeals to Jazz soothingly. Afrobeat’s earlier concerns, of militancy and socio-political criticism, seem to have dwindled considerably from the contemporary Afrobeat sound. There must be a socio-cultural explanation for this. We are in a democracy that has not been displaced by a military junta for more than a decade. Nigeria is not quite at the “promised land” in the light of colossal corruption, severe poverty, gross insecurity and lack of basic social amenities but censorship and withdrawal of freedom of expression are things of the past. Governmental criticism takes place everywhere: from barrooms to Twitter Timelines to Facebook status updates. About this time last year, I began a series of internet blog posts on Saraba Magazine calledFelabrating from a Distance. What I hoped to achieve was to advocate for a far-reaching introspection into the philosophy of Fela. I wrote that Afrobeat was the love child of oppressed humanity and African resilience. I reiterate, now, that Afrobeat is borne out of necessity. It is the piquant voice of outrage when governance runs amok. It is the bedroom voice that comments on societal vices. Afrobeat is a range. It spans from Afrocentrism through to socio-political criticism. Afrobeat, a graft from Highlife, is based on the musical idioms of Jazz. It is an admixture of Western sounds and African concerns. It is not music to be made by a studio producer using Digital Fruity Loops and other Pro tools. The Occupy Nigeria protests against removal of subsidy which took place earlier this year featured copious reference to Fela’s music. It goes without saying that in the hiatus occasioned by Fela’s death, there have not been adequate protest songs good enough to displace or upset Fela’s position. Instead, reputable musicians join voices to record campaign jingles and songs during the election periods, the likes sponsored by the late despot Gen. Abacha, when he was about to do a dress transition of his military rule to an autocracy. Indeed, there have been wars fought under the auspices of Afrobeat. Seun Kuti spoke to power against the contrived Five-thousand Naira note scheme on Twitter. This leaves hope in our hearts that the spirit of Afrobeat lives on: on our streets, on social media, on every Fela Vinyl Record, on every Fela cassette, on every MicroSD card, on every blaring car stereo, on every Home Theatre System, in every Nigerian heart, in every African heart.